1Academia de Ci?ncia e Tecnologia, S?o Jos? do Rio Preto, Brazil. 2Instituto de Quimica, Universidade de S?o Paulo, S?o Paulo, Brazil. 3Cardiovascular Diseases Institute (IMC), S?o Jose do Rio Preto, Brazil. Received: July 2, 2016; Accepted: September 27, 2016; Published online: June 22, 2017. TO THE EDITOR: Disturbances in iron metabolism are often observed after myeloablative conditioning in patients undergoing hematopoietic stem cell transplantation (HSCT) . A major determinant of this effect is a reduction in iron utilization resulting from erythropoiesis suppression by conditioning, leading to an increase in non-transferrin bound iron in plasma, including the labile plasma iron (LPI) pool, which is the redox-active, cell-penetrating, and toxic form of iron. In fact, there is evidence to suggest that about half of the amount of iron normally transported for erythropoiesis is released into plasma after initiation of conditioning . In most patients who undergo HSCT, LPI kinetics show a pattern in which conditioning promptly, as early as 48 h after its initiation, causes a substantial increase in LPI levels that persists until erythropoiesis is restored at engraftment . It has been suggested that increased levels of LPI may cause cell damage and ultimately lead to tissue toxicity, susceptibility to infections, and other complications commonly observed in the early post-HSCT period. Recently, we demonstrated an association between baseline LPI levels and regimen-related toxicity in patients who undergo HSCT; however, given the small size of the study, this observation should be confirmed in larger studies . From a practical perspective, obtaining tissues from patients undergoing HSCT to evaluate iron toxicity is not feasible. However, as nearly all patients with planned autologous HSCT are subjected to mobilization with granulocyte-stimulating factors and harvesting of peripheral blood mononuclear cells (MNC) by leukapheresis, we postulated that MNC represent a valuable, culturable, and easily obtainable material to examine iron-mediated cell toxicity. To determine whether increased LPI levels can cause cell toxicity, we evaluated their impact on the viability of MNC obtained from the peripheral blood of eight patients undergoing autologous HSCT for multiple myeloma (N=4) or non-Hodgkin's lymphoma (N=4). An environment with normal and increased LPI concentrations was created by collecting plasma samples before (baseline) and after conditioning (on day 0). LPI concentrations were normal (<0.5 µM) in all baseline samples (mean, 0.2 µM; range, 0–0.4 µM) and increased in all day 0 samples (mean, 2.0 µM; range, 1.1–4.0 µM). An aliquot of the leukapheresis product from each patient was obtained on day 0, just before infusion, and MNC were isolated by Ficoll gradient and placed in DMEM in duplicate for five days in four experiments: i) without the addition of plasma (control), ii) with the addition of autologous plasma with normal LPI levels (baseline sample), iii) with the addition of autologous plasma with increased LPI levels (day 0 sample), and iv) with autologous plasma with increased LPI levels (day 0 sample) in the presence of an iron chelator (50 µM deferiprone). MNC were cultured with autologous plasma at a 1:1 volume ratio. Viability of cultured MNC was determined by the trypan blue method at 3, 24, 48, 72, 96, and 120 hours. Informed consent was obtained from all individual participants included in this study, and all the procedures were performed in accordance with the ethical standards of the local institutional research committee. As expected, MNC viability decreased over time in all experiments (P<0.001; Fig. 1). There was no difference in viability between cells cultured without plasma (control) and cells cultured with plasma and normal LPI levels. 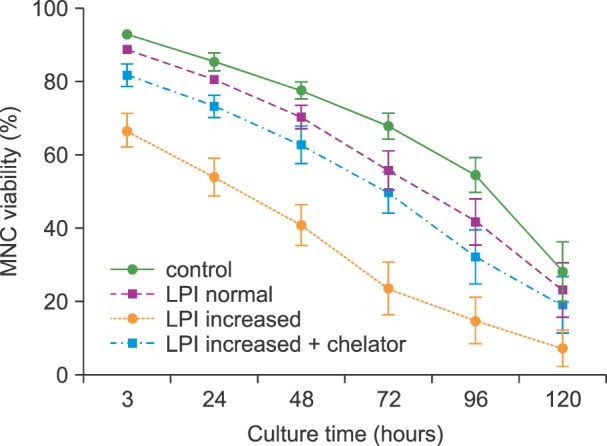 Cells cultured with plasma with increased LPI levels showed the lowest viability of cells in all culture conditions at all time points (P<0.001). Interestingly, the viability of cells cultured with plasma, increased LPI, and an iron chelator was similar to that of cells cultured with plasma and normal LPI levels at all time points (P>0.05). The reduced viability of MNC cultured with day 0 plasma samples could be attributed to factors other than increased LPI that promote reactive oxygen species (ROS) generation. Actually, a pro-oxidant state associated with increased expression of plasma oxidative stress biomarkers and reduced activity of plasma antioxidant enzymes, is usually observed following conditioning in HSCT patients . However, the fact that MNC viability was preserved simply by adding an iron chelator to day 0 plasma samples indicates that LPI itself is a major promoter of cell toxicity. In fact, iron overload in the bone marrow has been shown to increase ROS concentrations in erythroid cells, granulocytes, and CD34+ cells, and this was associated with decreased hematopoietic colony formation relative to that in normal bone marrow. These findings confirmed that ROS signaling played a role in deficient hematopoiesis in iron-overloaded bone marrow . Another in vitro study showed that free iron inhibited colony formation by erythroid and granulocyte-macrophage progenitors and reduced the size of colonies in a dose-dependent manner . Iron chelation appeared to show corrective potential against iron-mediated toxicity in hematopoietic cells. In myelodysplastic syndromes (MDS), where hematopoiesis is largely ineffective, iron overload has been shown to impair bone marrow function by suppressing the burst forming activity of erythroid progenitors . On the other hand, iron chelation therapy has been associated with increased erythropoietic activity and decreased cytopenias and transfusions in MDS patients . In vitro tests with cardiac and endocrine cells exposed to labile iron have shown that iron accumulates in organelles and increases ROS formation, affecting major cell functions such as permselectivity, electron transport activity, and viability. Again, iron chelation with deferasirox was effective in reducing iron-induced cell damage and increasing viability of these cells . If the in vitro effect of increased LPI on MNC viability on day 0 samples is assumed to occur also in vivo, this would have significant implications on engraftment, as stem cells are infused on day 0 and may be exposed to increased LPI. We showed that iron chelation in vitro can prevent this problem, and a clinical trial with standard doses of iron chelators during the peri-infusion period could confirm this impact of LPI on engraftment. In conclusion, our results indicate that increased LPI levels can substantially decrease the viability of MNC and that this effect can be prevented or at least attenuated by using iron chelators. Changes in the viability of mononuclear cells cultured without the addition of plasma (control), with the addition of autologous plasma with normal LPI levels (LPI normal), with the addition of autologous plasma with increased LPI levels (LPI increased), and with the addition of autologous plasma with increased LPI levels and 50 µM deferiprone (LPI increased+chelator). Majhail, NS, Lazarus, HM, Burns, LJ. Iron overload in hematopoietic cell transplantation. Bone Marrow Transplant, 2008;41;997-1003. Evens, AM, Mehta, J, Gordon, LI. Rust and corrosion in hematopoietic stem cell transplantation: the problem of iron and oxidative stress. Bone Marrow Transplant, 2004;34;561-571. Parkkinen, J, Sahlstedt, L, von Bonsdorff, L, Salo, H, Ebeling, F, Ruutu, T. Effect of repeated apotransferrin administrations on serum iron parameters in patients undergoing myeloablative conditioning and allogeneic stem cell transplantation. Br J Haematol, 2006;135;228-234. Pullarkat, V. Iron overload in patients undergoing hematopoietic stem cell transplantation. Adv Hematol, 2010;2010;345756. Bradley, SJ, Gosriwitana, I, Srichairatanakool, S, Hider, RC, Porter, JB. Non-transferrin-bound iron induced by myeloablative chemotherapy. Br J Haematol, 1997;99;337-343. Naoum, FA, Espósito, BP, Ruiz, LP, et al. Assessment of labile plasma iron in patients who undergo hematopoietic stem cell transplantation. Acta Haematol, 2014;131;222-226. Dürken, M, Agbenu, J, Finckh, B, et al. Deteriorating free radical-trapping capacity and antioxidant status in plasma during bone marrow transplantation. Bone Marrow Transplant, 1995;15;757-762. Zhao, M, Xie, F, Li, Y, et al. Increased intracellular concentration of reactive oxygen species mediated the deficient hematopoiesis of iron overload bone marrow. Blood (ASH Annual Meeting Abstracts), 2010;116;abst 4247. Juvonen, E, Sahlstedt, L, Parkkinen, J, Ruutu, T. Inhibition of erythroid and granulocyte-macrophage colony formation by non-transferrin-bound iron in vitro: protective effect of apotransferrin. Eur J Haematol, 2007;79;126-131. Hartmann, J, Sinzig, U, Wulf, G, et al. Evidence for a suppression of the colony forming capacity of erythroid progenitors by iron overload in patients with MDS. Blood (ASH Annual Meeting Abstracts), 2008;112;abst 2694. Jensen, PD, Heickendorff, L, Pedersen, B, et al. The effect of iron chelation on haemopoiesis in MDS patients with transfusional iron overload. Br J Haematol, 1996;94;288-299. Glickstein, H, Nick, H, Cabantchik, ZI. Susceptibility of endocrine, cardiac, and macrophage cell lines to iron-mediated oxidative damage and the cytoprotective effect of the orally active chelator deferasirox (Exjade®, ICL670). Blood (ASH Annual Meeting Abstracts), 2007;110;abst 3825.